Is the tile floor “thin-set” or “mud-set”? Was the house built before 1978 and lead safe work practices need to be used? Is there parking available or is someone constantly running to a meter? What floor is the bathroom on? Is everything going up a few flights of stairs? How much design time is involved? Is there galvanized pipe that should be replaced? Does a radiator need to be removed and reset? Is there sufficient electrical and lighting in the space? Is there an exhaust fan in the space? Is it properly vented? Is anything to be moved/ rough-ins being relocated? 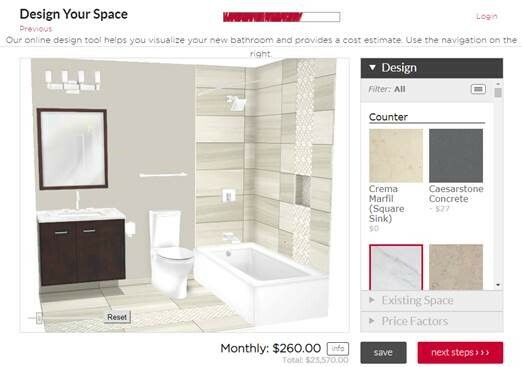 Per our handy bath pricing tool (www.casebaths.com) a remodeled bath that looks like the picture illustrated above is $23,570. 00. Is that what your bathroom will cost? Probably not but using the above parameters you should anticipate a project costing in the $22- 25,000 range.